Distinctive call is rough “prrrt.” Also rolling “ka-wheer;” accent on second syllable. Description: Sexes similar. 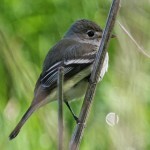 Olive-brown above with a bushy crest; light yellow underparts; gray-white throat; cinnamon rust primaries and tail feathers; slender bill; and two white wing bars. 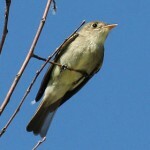 Underparts are less contrasted than in Great Crested Flycatcher. 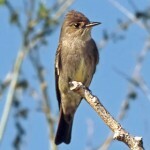 Habitat: Usually found in open woodlands, oak canyons, deserts, and riverside groves. Where in Nebraska: Accidental. However, the single sight record in 1957 from western Nebraska is questionable. 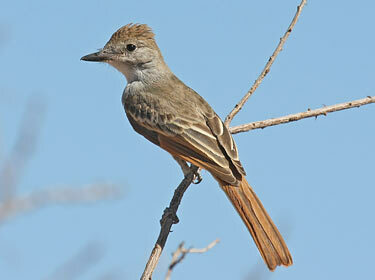 Fun Facts: These birds nest in cavities, and often include pieces of shed snakeskin in their nests.